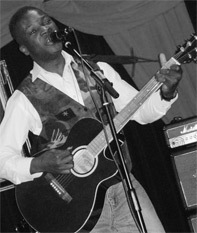 Adam Tunji grew up with musical influences from The Slade, Jackson 5 to Fela. He started out as a performer in Art College with the group Sleek and with Mr Kool. He also performed as a solo artist singing covers of Artists ranging from Colonel Abrams, Gregory Isaacs, Kenny Rogers, Norwood, to Kool and the Gang. The song writing started from his early high school days. This he morphed into scriptwriting for comic strips and animation videos while working as a Caricaturist in London which he still does. This has been a platform for exploring genres ranging from Acoustic, Cheese Dance, Alternative and Rock. As a lyricist, he has also co-written some fine songs with Rick Veronese and Linda Nordstrom. The West Coast of Africa is his new ground for musical exploration. This has brought about his own flavour of Afro-Fusion. Song writing took a new turn with the formation of RKFM records in December 2003.